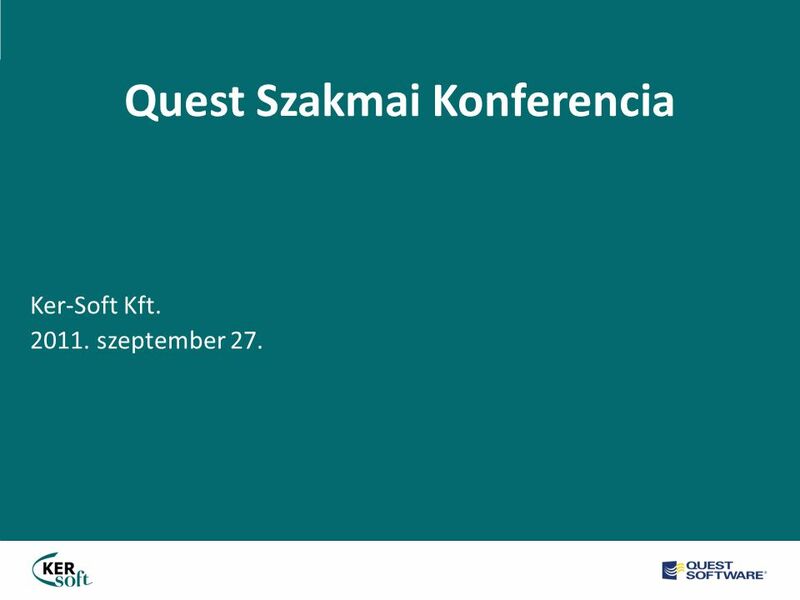 Quest Szakmai Konferencia Ker-Soft Kft. 2011. szeptember 27. 1 Quest Szakmai Konferencia Ker-Soft Kft. 2011. szeptember 27. 7 Ker-Soft Számítástechnikai Kft. Microsoft Ceritifed Professional (MCP) Microsoft Certified System Engineer (MCSE) • Windows NT • Windows 2000 • Windows XP • Windows 2003 • Messaging • SQL Server 2000 Microsoft Certified Technology Specialist (MCTS) • Exchange Server 2007 Configuration • Microsoft.NET Framework 2.0 - Application Development Foundation • Windows Server 2008 Applications Infrastructure, Configuring • Windows Server 2008 Network Infrastructure, Configuring • Windows Server 2008 Active Directory, Configuring • Configuring Microsoft Windows Vista Client Szakértőink minősítései -1. 8 Microsoft Certified Technology Specialist (MCTS) – folytatás • Microsoft Office SharePoint Server 2007, Configuring • Microsoft® SQL Server™ 2005 - Implementation and Maintenance • Microsoft® SQL Server™ 2005 – Database Administrator • Microsoft Internet Security and Acceleration (ISA) Server 2006, Configuration • Microsoft Forefront Client and Server, Configuration Microsoft Certified IT Professional (MCITP) • Windows Server 2008, Enterprise Administrator • Applications for Microsoft Dynamics CRM 4.0 Microsoft Dynamics Certified Professional • Microsoft Dynamics CRM Customization • Microsoft Dynamics CRM Application • Microsoft Dynamics CRM Install & Config Microsoft Sales Specialist Microsoft Certified Trainer (MCT) Szakértőink minősítései -2. 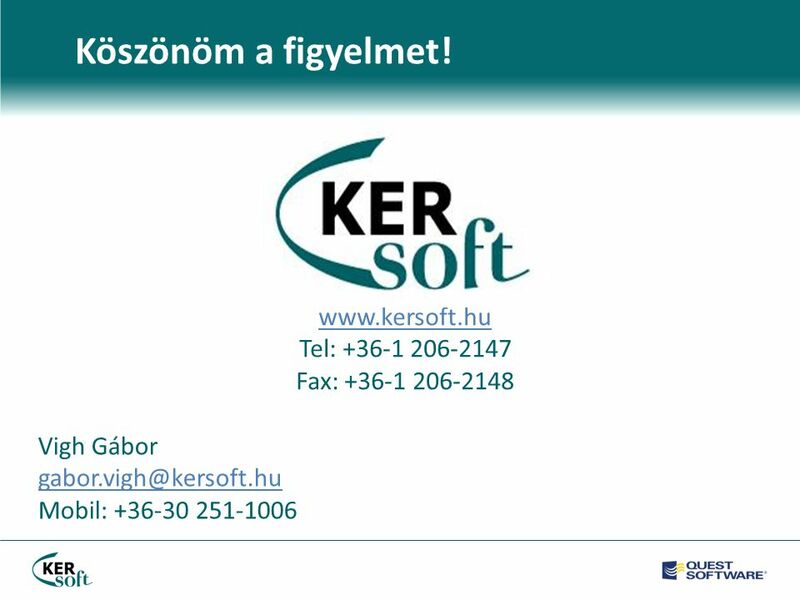 Ker-Soft Számítástechnikai Kft. 9 CA eTrust Threat Management Certification • CA eTrust Threat Management CA SmartTM Technical Advanced Certification • Unicenter • eTrust • BrightStor CA Partner Education • Certificate of Completion - Sales Training • Certificate of Completion - ARCserve Backup for Windows r12: Overview 100 Exam • Certificate of Completion - Ca XOsoft Replication r12: Overview 100 Exam • Certificate of Completion - Ca XOsoft High Availability r12 Overview 100 Exam • Certificate of Accreditation - Ca ARCserve Backup for Windows r12.5: Impl. 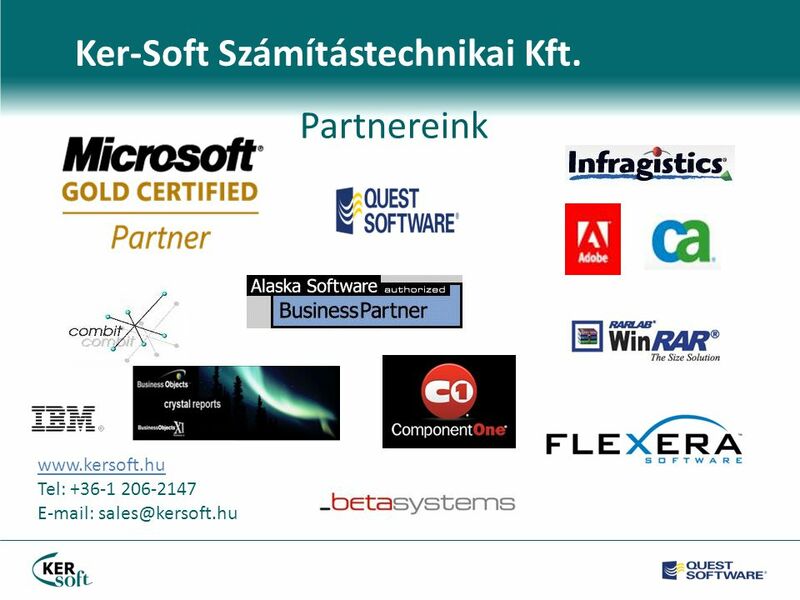 200 Exam • Certificate of Accreditation - Ca XOsoft Replication r12.5: Implemetation 200 Exam • Certificate of Accreditation - Ca XOsoft High Availability r12.5: Implemetation 200 Exam Ker-Soft Számítástechnikai Kft. Szakértőink minősítései – 3. 10 Beta Systems • Identity Management Specialist • eSSO Single Sign-On Specialist • Front Collect Invoice Specialist VMware Professionals • Vmware Certified Professional on VI3 (VCP 3) • Vmware Certified Professional on vSphere 4(VCP 4) • Vmware Technical Sales Professional (VTSP) • Vmware Sales Professional (VSP) IBM Tivoli • IBM Tivoli Security Solution Sales Professional • IBM Tivoli Web Sphere Solution Sales Professional • IBM Tivoli Monitoring Technical Sales Mastering • IBM Tivoli Identity Manager Technical • IBM Rational Application Developer Technical Sales Mastering Szakértőink minősítései – 4. 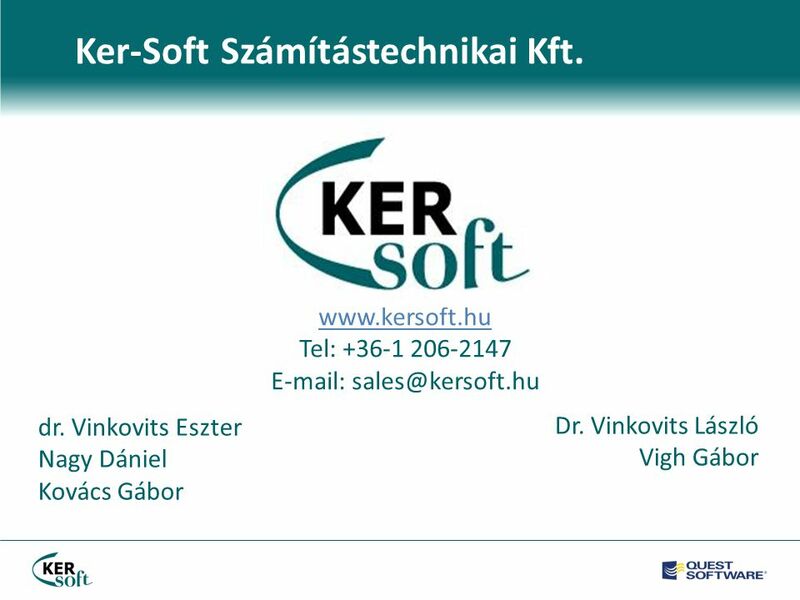 Ker-Soft Számítástechnikai Kft. 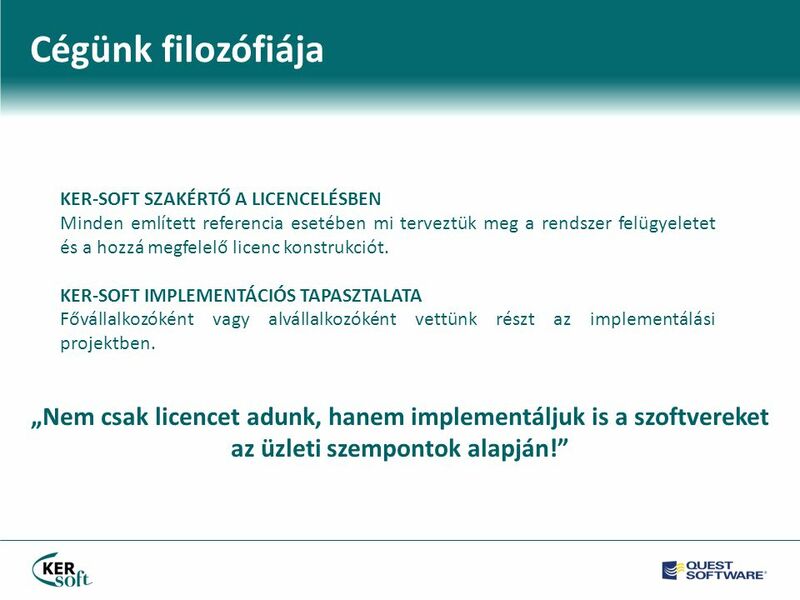 11 Cégünk filozófiája „Nem csak licencet adunk, hanem implementáljuk is a szoftvereket az üzleti szempontok alapján!” KER-SOFT SZAKÉRTŐ A LICENCELÉSBEN Minden említett referencia esetében mi terveztük meg a rendszer felügyeletet és a hozzá megfelelő licenc konstrukciót. 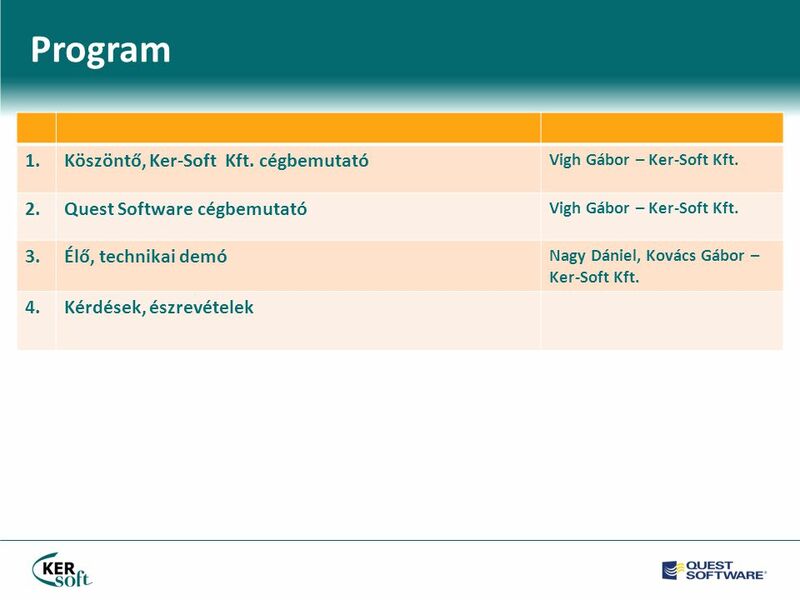 KER-SOFT IMPLEMENTÁCIÓS TAPASZTALATA Fővállalkozóként vagy alvállalkozóként vettünk részt az implementálási projektben. 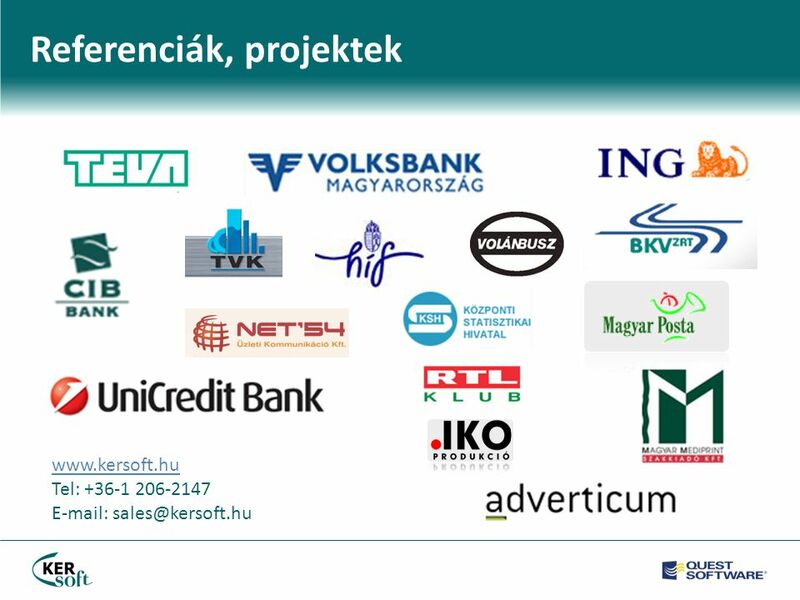 Letölteni ppt "Quest Szakmai Konferencia Ker-Soft Kft. 2011. szeptember 27."